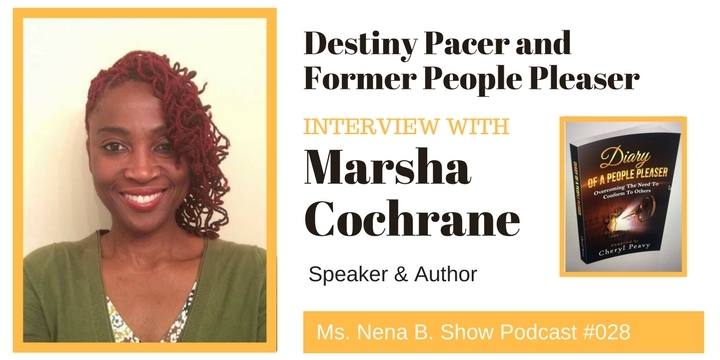 028 – Interview with Marsha Cochrane, Destiny Pacer and Former People Pleaser – Ms. Nena B.
Marsha Cochrane is a speaker, writer and destiny pacer who has delivered motivational speeches to a multitude of young minds as they prepared to graduate from elementary school. Working with young people through church and community groups, Marsha has been able to reach into homes, communities inspiring mothers and entire families. She is a native Jamaican who migrated here to the United States of America a little over two years ago, in search of and is actually walking in her true purpose. Marsha is passionate about helping others to discover and walk in their divine destiny. Though having eventually, triumphed over sexual abuse inflicted at the tender age of seven, the post-traumatic disorders caused innumerable self-esteem and interrelationship issues. Emotional suffering, self-denial, and underachievement plagued her life for more than two decades. Through her relentless search for clarity, and freedom to be who she knew God wanted her to be, she released the chains of her past. Collaborating with these powerful women of faith and purpose has heightened the propensity of Marsha’s walk into the arms of destiny. She intends to continue to empower others including her two daughters Ashleigh and Azurie to live life on their own ground, pleasing only God first and foremost. Chance Web Series - S01:E01<< >>029 - Interview with Andrea Merriman, Turning Pain into P.E.A.R.L.S.